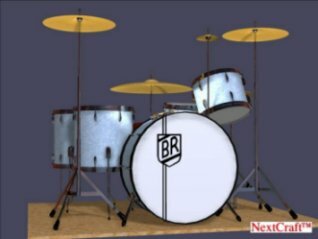 Over the years Buddy used a few different kits, including Ludwig, Vox, Rogers, but he mainly used Slingerland. 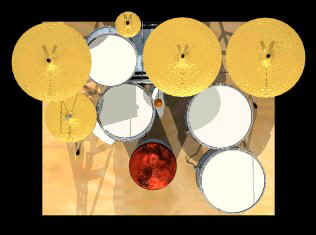 He also used a Fibes snare drum which can be seen on the album cover of Live At Ronnie Scotts. But as far as I know he always used the same size equipment. And the same set up. 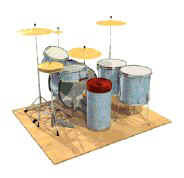 Except for the large swish cymbal he added later on in his career. Two 16" X 16" Floor Toms. Ludwig speed king bass drum pedal or Rogers Swiv-o-matic pedal. Wooden Throne in White Marine Pearl . A little over 24" tall, including the padding. 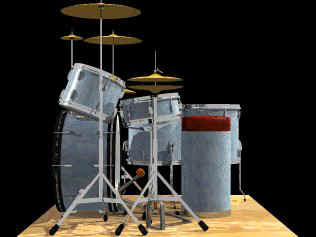 this view Buddy's snare drum tilting forwards and cymbals where always set up horozontaly. Notice everything is in easy reach. Buddy never had to stretch to reach a drum or cymbal. 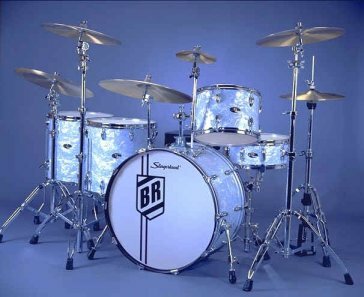 Below is the Buddy Rich singnature kit, made by Slingerland drum company. It is obviously set up for a promotional shot so you can see everything. But it gives you a good view of what Buddy used. 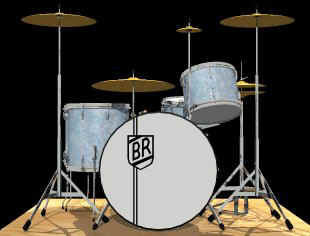 The Buddy Rich signature kit by Slingerland drum company. Thease are not facts. Just what I think Buddy used. If you think its wrong please let me know. If you have any questions or know of any other equipment Buddy used please use the Discussion Forum to post a message.